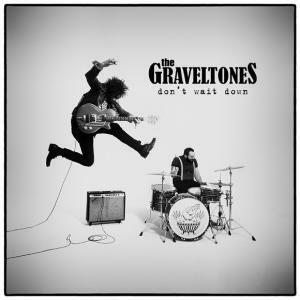 London’s hotly tipped, blues soaked, garage rock ‘n’ rollers THE GRAVELTONES are excited to announce a new single “Bang Bang” that will be released on the 8th September 2014. The single is taken from their debut album ‘Don’t Wait Down’, that was released through the bands own independent label Lagoon Dog Records and distributed by RSK Entertainment. The band will also be heading out on a full regional UK tour this August / September. With lyrics being compared to Bob Dylan, riffs to Rage Against The Machine, vocals to Howling Wolf and beats to Bonham, it’s easy to see why the dynamic duo have been stirring up such a frenzy on the London scene amongst music press and fans alike. Having smashed their way through their pledge campaign, the band recorded their debut at Monnow Valley and Miloco Studios and was produced by The Graveltones along with the producer Charlie Francis (REM, The Noisettes, Future Of The Left). The album was re-released in March as a deluxe edition featuring new tracks. 2013 was a hugely successful year for the band, having released their eponymous debut EP to rave reviews with Londonist naming #1 in the ‘Top London Bands To Watch In 2012’. The band have played an impressive 350 shows across the UK, Europe and Australia, including 4 UK tours with the likes of The Temperance Movement and American rockers Rival Sons. They also landed sync deals with the Irish Lottery and cosmetic giants Rimmel who took advantage of their phenomenal studio sound using the bands 1st single ‘I Want Your Love’ to front their national TV advertising campaign against the face of Kate Moss. 2014 is sure to see the band cement their position as one of the most exciting new live acts. The band will be heading out on a full UK regional tour and will be playing at Download Festival 2014.